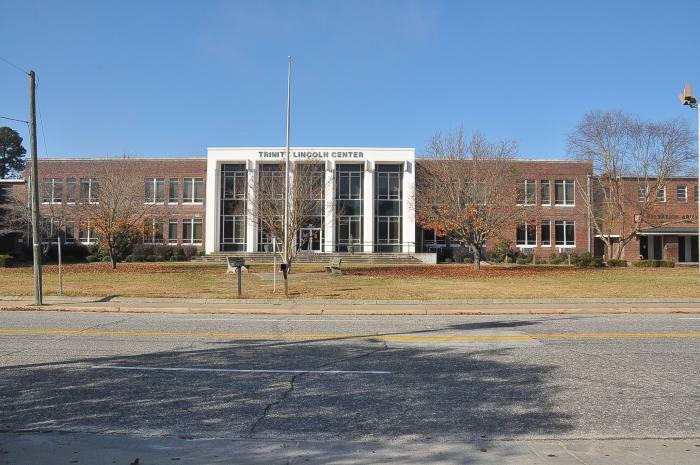 Lincoln High School is significant in the area of education as the center of African American educational, civic, and community life in Sumter from 1937 to 1969. It is a local representation of segregated education in South Carolina and is a tangible reminder of the state of South Carolina’s school equalization program of the 1950s, an attempt to equalize educational facilities for African American students in hopes of forestalling racial integration. Lincoln High School was established in the 1930s as the high school for African American students in the city of Sumter. The building occupies the former site of a schoolhouse for African American students dating from 1874, which was also referred to as “Lincoln School.” The core of the high school building that remains today was constructed in 1937 in a modern-style. It was later expanded in 1952 with the addition of two large wings. The south wing housed primarily classroom space along with a cafeteria and library, while the north wing included a gymnasium. These additions were also constructed in the modern style. Though a significant alteration was made to the building circa 1967, when a two-story white stucco façade that offers the appearance of columns was added to the main entrance of the building, this change was made during the period when Lincoln High School remained a segregated school for African American students. The form of the building therefore retains integrity from, and continues to convey the history of, segregated education in Sumter County. Listed in the National Register January 27, 2015.